Starting over in a Post-Journalism World, Part Fifteen. September 12, 2018 by Alexandra Kitty in Alleged Journalism, F.R.E.E.D. Oh my, oh dear, what a dreadful tintinnabulation coming from the bowels of Toronto. 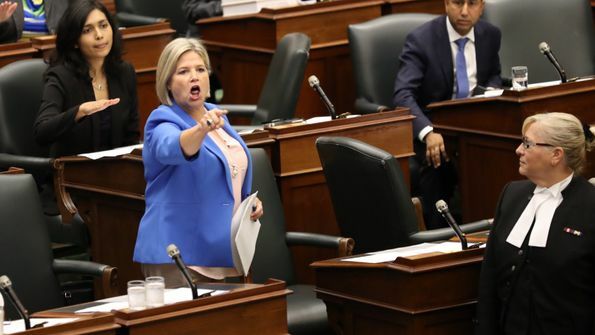 The temper tantrums are continuing, of course, with the usual child-like pouting of calling step-daddy Doug Ford a despot, tyrant, and dictator because he isn’t lavishly giving away money the way mommy Kathleen Wynne did and daddy Dalton McGuinty did before that. It has become quite pathetic, but Toronto the Teenager is learning that life isn’t always rigged to be fair to you. They, in essence, outsmarted themselves, and are trying to shout down reality by screaming a false narrative. The National Post’s Andrew Coyne is being silly and melodramatic in his column. All because Doug Ford is being unpredictable and not following the rules his political adversaries created and rigged to their benefit. Not everyone wants to play a game that is rigged for them to lose. It was a nightmare when he decided that the areas who didn’t vote his party aren’t going to be the benefactors of political largesse, but that he had their number and checkmated them proves that he is far more cunning than the Toronto elites see themselves to be. Forty percent is enough to get you a majority. It was more than the almost 38% Kathleen Wynne won in 2014. It is a full percentage more than what Justin Trudeau’s federal Liberal party got in 2014 when they got their majority, yet no one on the Left bitched about how those parties got to make decrees with less than 50% of the population voting for them. And for all the talk that this is a vendetta against Toronto City Council because of Ford’s late brother and former mayor Rob. I do recall that era very well, and Council was trying to find every loophole under the sun to get rid of him before his term ended, even though he was democratically elected and it was not their mandate — or at least nullify his power. But you see, that was all okay and different,. Oh, and Rob Ford won in 2010 with 47.11% of the popular vote. Yes, those dirty little people always ruin those snorefest cocktail parties that end up getting #MeToo’ed with some tyrannical white guy getting exposed as a spiteful and petty perv. How sad. What is worse, is that the NDP are in full meltdown mode. Remember when our naive friend Andrea Horwath was all giddy on election night when her party lost, but was happy that they came in second instead of third? Well, reality set in, judging by this picture. And if the premier wants to turf her out during a debate, he can and did. The NDP can stall it a bit, but it will pass. They have no power being in the opposition. This move by Ford will have a devastating effect on the NDP as they very often begin their political careers in municipal elections, which are far cheaper and easier to win than a provincial or federal campaign. It helps generate connections, get name recognition, and if you aren’t the relative of an established politician, aren’t rich, or did not have a career in broadcast journalism, city council is the way to break into the business. And now their pool in a critical city has been gutted. And the NDP has as much clout as protesters, who have none. Banging on desks was a childish and uninspired protest, but that is pretty much all they can do, other than be minor irritants. Spoiled brats in soggy underpants, nothing more. Both Toronto and the NDP are being punched in their faces by the reality of the situation. Power doesn’t always come in numbers or winning a political seat. The courts can be subdued and even nullified as their power only goes so far. If the premier chooses not to indulge them, they are put in their place. The judiciary has a critical role to play in a democracy. So does the media. And so do the voices of everyday people – this is their legislature and their province. The judiciary are at the mercy of the ruling regime. They can be removed, or have their rulings tossed. It is political goodwill that gives them power. The media is dead. They have been throwing fits at both Ford Brothers for years: had Rob not died and could run again, he would have handily won a second term. Journalism is no longer a thing as they keep insisting on being partisan. The voices of everyday people spoke on election, and Ford’s supporters applaud this move of getting away from a Toronto-centric model of doing business in this province. Not everyone lives in Toronto or reaped the benefits of what Hogtown received for the previous fourteen years. The truth is simple: the press in Ontario could not be more unprofessional, propagandistic, or partisan. Their narratives deceive those on the Left into thinking they are the heroes, and some governmental They will save the day to rig the games to favour them — as if it were proof of their superiority and moral correctness. If an alternative actually showed the reality and truth, the Left would not be so insufferably cocky. They would see their brass are as corrupt as their political rivals. They would see how they have been wasting time voting ideologically instead of pragmatically.